After an unplanned break, I'm happy to be back on air with a new episode, new introducer, and new music! 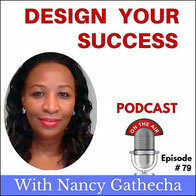 Today we talk about 3 core areas to nurture if you desire balanced success and harmony. These areas if left unchecked could sabotage us long-term. We could unknowingly be sacrificing the wrong offerings on the altar of success. When coaching my clients who want to achieve their dreams and goals, we work with a simple, but powerful tool called The Wheel of Balance. It has six core areas, essential if we're to enjoy harmony in life and business. The balance concept is based on my book best-selling book, Vision Boarding The Faith-Based Way - How to Activate Your Dreams. Develping a vision in the 6 areas sets the foundation for holistic success because when we completely ignore one or more of them we have dis-harmony. Like trying to drive with a flat or unbalanced tire. Left unchecked we get dis-stressed and even experience dis-ease. The success journey gets bumpy, dangerous and even life-threatening. On this episode I share why I had to go MIA for a few weeks to practice what I peach. 3. Health - Fitness and Self-care. Tune in and discover how to avoid the subtle trap of propping up your success ladder against the wrong wall. Happy listening and let's continue the conversation below in the comment section.